The leading financial powerhouse of Europe, Frankfurt is on the way to becoming one of the global Fintech scaleup producers. According to Startup Genome’s Frankfurt Startup Ecosystem Report, there are approximately 400 technology-based startups in Frankfurt and among all the 100 ecosystems studied in the report, Frankfurt had the highest concentration of Fintech startups with every 1 in 8 startups being a Fintech. Over the period 2012-2017, approximately 50% of all VC funding in Frankfurt based startups was received by the Fintech startups. Frankfurt has got all the ingredients to become the leading ecosystem for Fintech startups. Proximity to regulatory authorities, the presence of strong corporate landscape of financial institutions and insurance companies are two important factors that make Frankfurt an attractive destination for founders. In the last three years, the amount of early-stage funding invested in Frankfurt based startups has grown at a brisk pace. In fact, the amount of early-stage capital invested in Frankfurt based startups has grown twice as fast as the global median across all ecosystems. Considering the growth rate in other similar ecosystems, Frankfurt’s growth rate is one of the highest growth rates in the world. Certainly, this is a positive sign and signifies the fact that investors are recognizing the growth potential in Frankfurt. However, there are certain issues which are hampering the growth of Frankfurt as the next big fintech ecosystem. One such limiting factor is the “funding gap” in early-stage funding. According to Startup Genome’s ecosystem lifecycle framework, ecosystems are classified into activation, globalization, expansion and integration phases. Frankfurt’s startup ecosystem is put in the first or the activation phase. In this phase, an ecosystem is still in the process of attracting more talent and investments and the rate of production of early-stage success is substantially lower than the ecosystems in the integration phase. Despite the swift growth in early-stage funding and accounting for the fact that most of the Frankfurt startups are bootstrapped, Frankfurt still faces a gap in total early-stage funding. 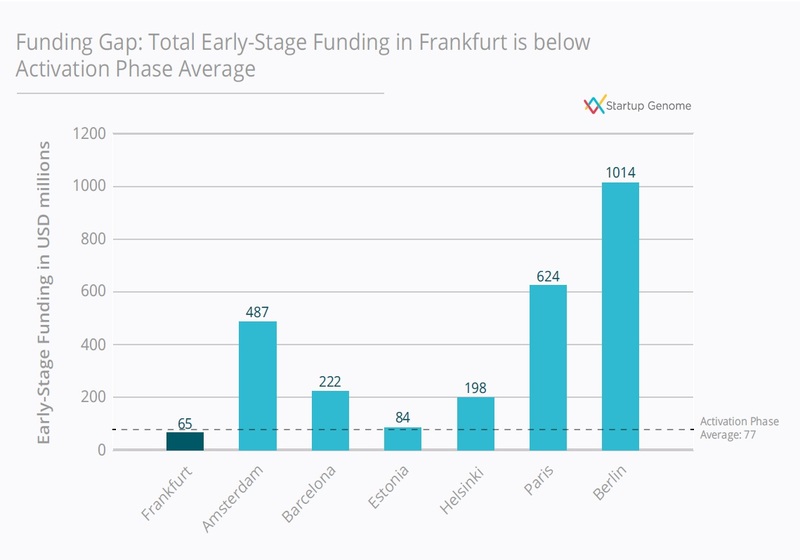 At $65 million in total early-stage funding (early-stage funding consists of all seed and Series A investments) Over the period studied in the report (2012-2017), Frankfurt’s amount is 16% lower than the Activation phase average. For the sake of comparison, the average at Globalization phase (second phase in startup ecosystem lifecycle) is nearly $400 million. Since the average early-stage funding for an ecosystem in the activation phase is $77 million, Frankfurt is not lagging far behind, however, to enter the next phase, Frankfurt will require more early-stage funding. In the future, more startups will be created in Frankfurt. To sustain the growing number of startups, Frankfurt will have to ramp up the early stage investments at an elevated rate to keep up. This is certainly a challenge as the amount of early-stage funding is growing but it will have to keep on growing at a faster rate. An interesting aspect about the seed and Series A funding rounds in Frankfurt is that median size of these rounds is quite high. The median seed round is around $0.55 million and Median Series A round is around $4.2 million. Nevertheless, the funding landscape in Frankfurt is likely to change. In the coming years, as startup output will grow and the amount of early-stage funding will increase, the investment orientation of the ecosystem will shift as well. However, the focus should be more on funding more deals rather than increasing the size of rounds. Gautam is currently interning at TechQuartier where he focuses on research and community management. In his final year of Master's at EBS Universität, one of his main focus is on venture capital. At EBS he was the Head of Research Department of EBS Invest-Finance club of EBS University. He is also the Co-Founder of an import-export consulting firm based in Grenoble, France and he advises a sports club called Vikings Club in Paris.